November 2016 | gingerbread smiles. Although Lithuania is not somewhere I would have considered visiting before, we recently hopped on a flight to its capital Vilnius and had an amazing time. You may not think much of this Baltic state, but hopefully by the end of this post you'll be booking your travel to this gorgeous city. In an effort to sell Lithuania's capital city to you, I've written a list of ten reasons why you should put Vilnius high up on your list of places to visit. 1. The most popular cities in Europe usually have you paying over odds for your food, drink and travel. Vilnius is a relatively cheap and affordable place to visit, even with the weak Euro/Pound situation at the moment. We visited restaurants and found the bill to be around the same or cheaper than it would be here in the North of the UK. 2. Vilnius offers something completely different from what I've experienced before. 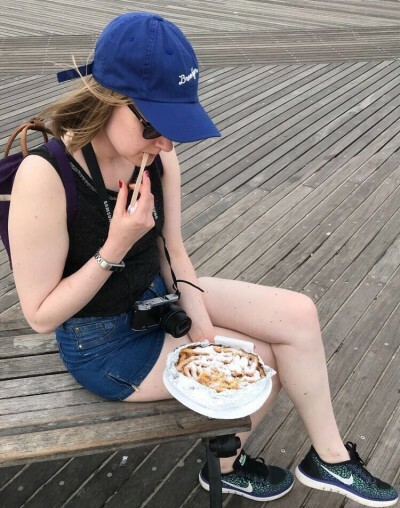 I've been to the usual Spanish, French and German destinations but sitting next to Russia within the Baltic states, Lithuania boasts different food, an unusual language and so much to explore. 3. When walking into the old town of Vilnius you'll see that the architecture in this city is beautiful. There is such a fantasy vibe to most of the town with its exquisite colourful buildings towering around you. 4. 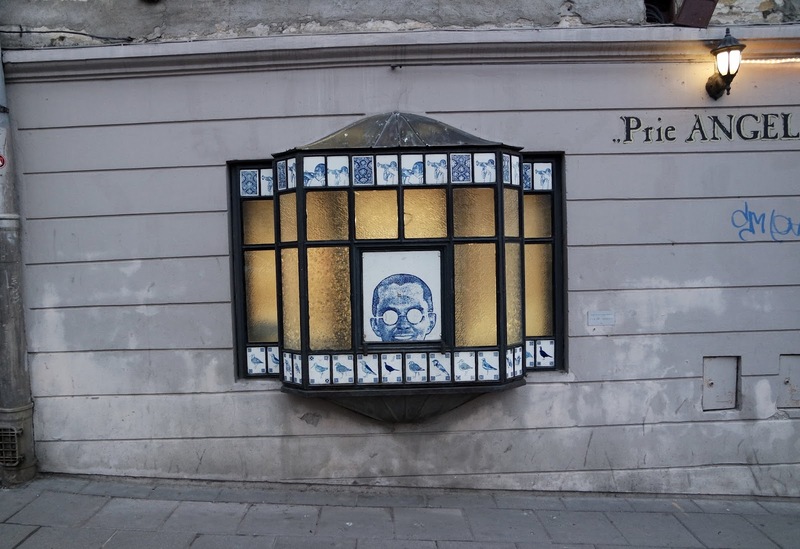 In Vilnius there are lots of places to eat and drink. Although it takes a little bit of research and a map to find what you're looking for, when you do you'll see the vast selection of cuisines and settings. Whilst there we ate Italian, American and Indian although we missed out on eating their local Lithuanian food which was readily available with many authentic restaurants dotted around the city. 5. Getting around Vilnius is really easy to do on foot. You'll have to take a really comfy pair of trainers as the terrain isn't always smooth, think lots of cobbles, but its easy enough to get around with a trusty map. We walked all throughout the day time, only taking taxis at night to get to restaurants for our dinner. 6. Another great thing about Vilnius is that there is no real language barrier. As it's a city, most places have a relatively good understanding of the English language. Although we did try to learn some words in Lithuanian, its a tricky language to master and we found that we could get by easily as lots of the menus, signs and plaques had English translations. 7. In our guide book it states that "it is not an exaggeration to say that Lithuania is one of the safest countries to visit in Europe". Although we continued to be vigilant and keep our belongings close whilst on our trip, we did feel better knowing this and the atmosphere in the town felt quite safe when we were out and about. 8. Whilst in Vilnius we felt that there was a very laid back atmosphere with none of the hustle and bustle you'd find in other cities. We did visit during the week, so it may be different on weekends, but after speaking to a girl who studies over there, she confirmed our thoughts and said it was very chilled out. 9. 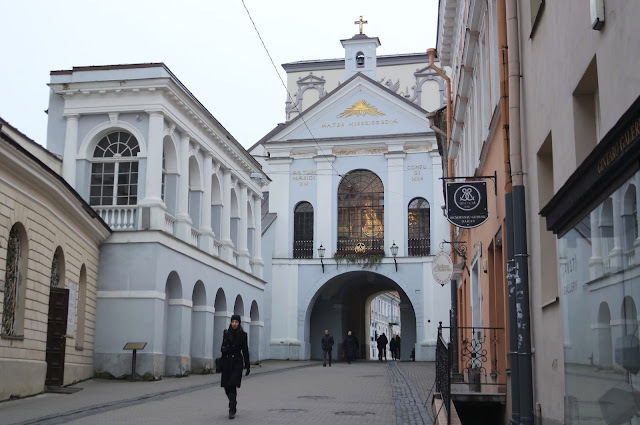 As with many other European cities, Vilnius has a lot of history to offer. 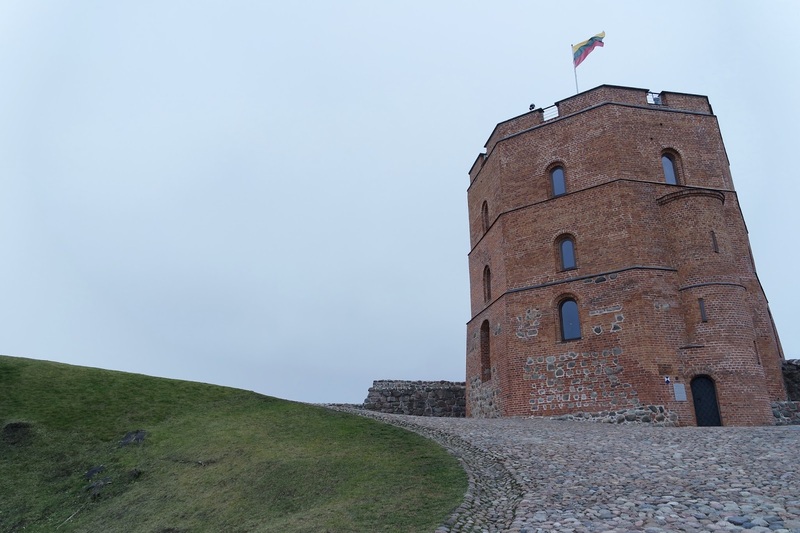 When we climbed to Gediminas Castle on our first day, as well as learning about the castle itself, we also learnt about the Baltic Way which was extremely interesting and eye opening. Throughout our trip we learnt the history of the many buildings we came across. 10. 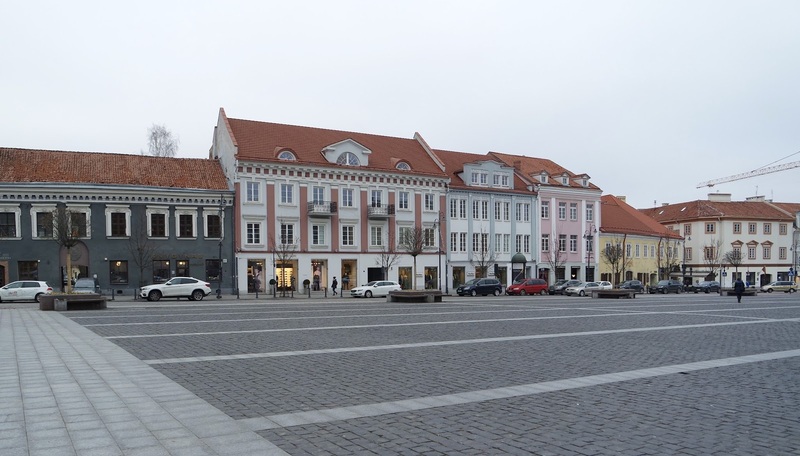 Finally, before coming across flights to Vilnius on SkyScanner, we hadn't heard of the Lithuanian capital city and had never considered visiting. At only £80.00 for return flights for two and a hotel for three nights at £130, this was a very cheap trip that we couldn't pass up. Vilnius is a relatively 'new' destination for people to travel to which offers everything other European cities do, with the opportunity to discover a place not touched upon by many as of yet. So what do you think? Is Vilnius now on your travel destination list? I hope it is, as it's honestly a lovely place to visit and we'd be back again in a heartbeat. I'd never visited a spa until I was kindly invited along to try Ramside Spa. Going to a spa had always been on my list to do, but with the cost and the time associated with it, I had just never got round to booking an experience. 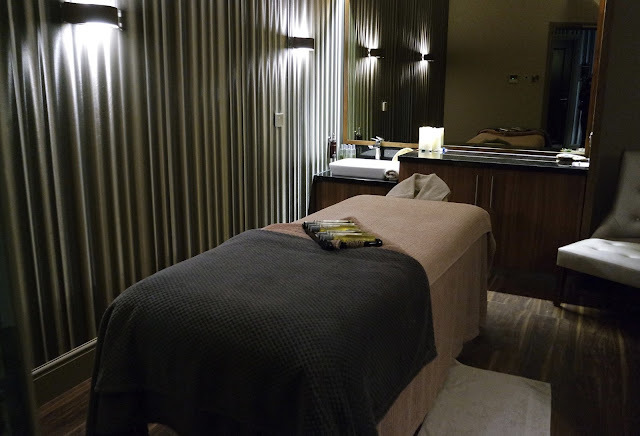 When an email dropped into my mail box to go along with other local bloggers to try out the luxious Ramside Spa, I instantly responded saying YES please! Opened last year, the spa was part of a £16M redevelopment of Ramside Hall bringing a whole host of added extras for guests and locals. 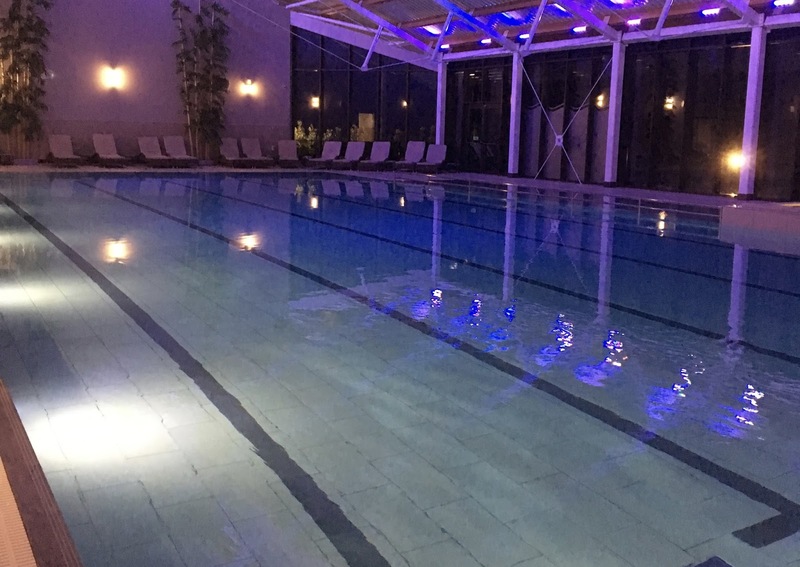 The spa boasts five pools, one of which is a full size 25m swimming pool, a wellness spa, 14 treatment rooms with a long list of gorgeous treatments available and a number of thermal suites. We were given a tour around the facility by membership co-ordinator, Jasmin, who showed us the extensive gym which has a number of fitness classes daily as well as the latest technology, gave us a tour around the spa with highlights of a gorgeous manicure/pedicure hub and dreamy treatment rooms then walked us back through the spa's on-site restaurant, Fusion, serving Pan Asian cuisine. When the tour was complete we had a few nibbles, and then got our robes and flip flops to enjoy the spa. 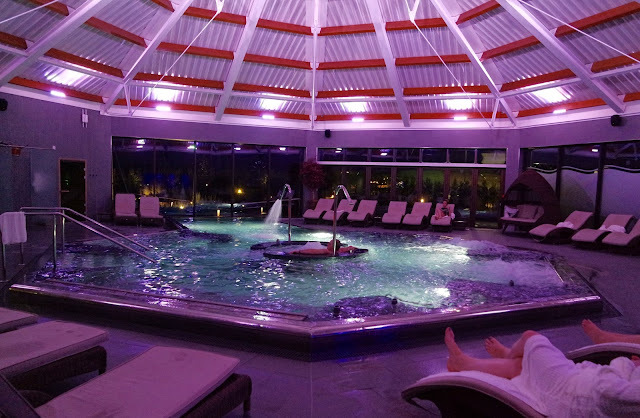 I think the spa is like a playground of adults, full of interesting parts which you want to try out as soon as possible, getting excited as to which one you will start with. Myself and Kirsty (Number Twenty Six) got into our swimsuits and started in one of the UK's largest hydrotherapy pools testing out the numerous massage jets. It was such a relaxing experience that we could have spent all night just in that pool alone, but we knew we had more to try out! 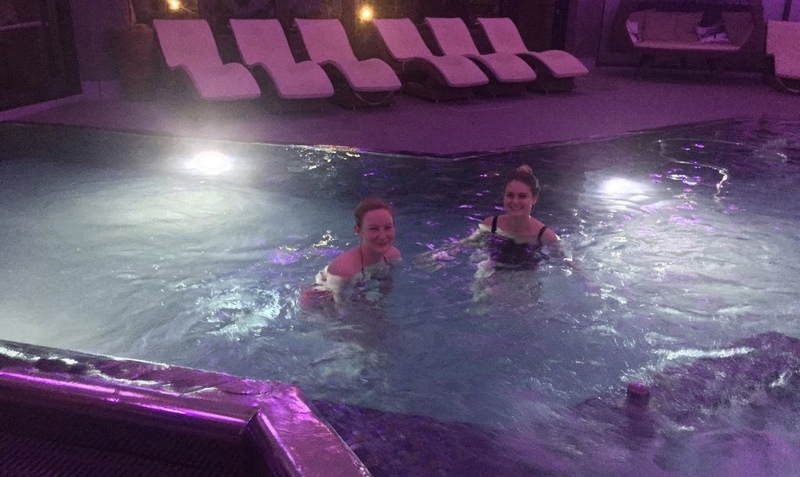 From the hydrotherapy pool, we ventured outside searching for the outside vitality pool which was lit up like a disco. It was cold outside but once emerged into the pool it was boiling! A lovely experience to be in a warm pool surrounded by a cold breeze, this was another great pool. Although the pool was lovely, it got a little too warm for our liking so we braved the cold to go back inside. Now it was time to try out the different steam/sauna rooms of which there are 5! 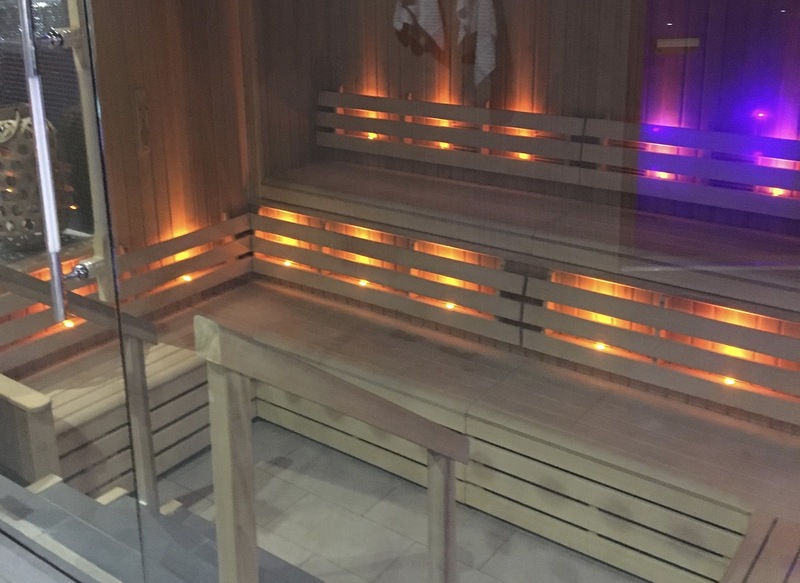 There is a Herbal Sauna, Himalayan Salt Steam, Aroma Steam, Tepidarium and a Sunken Amphitheatre Sauna. We experienced all of these different rooms apart from the Tepidarium as we couldn't get the door open. To save our embarrassment, we passed on that. They were all brilliant but my favourite was the Aroma Steam. I think because it was similar to other steam rooms I'd been in before but much more modern in comparison. Finally we topped off our visit with a fruit water and another dip in our favourite, the hydrotherapy pool. After some more chatting, we went to get showered and set back off to Middlesbrough. I must add that the locker room and showers are top notch. I could have stayed in the shower all night, and with the addition of ESPA products to use whilst in there, it was brilliant. Overall I had an amazing first experience at a spa. It was so relaxing and turned into a really fun evening. I'd definitely visit another spa, and would definitely consider it being Ramside Spa. 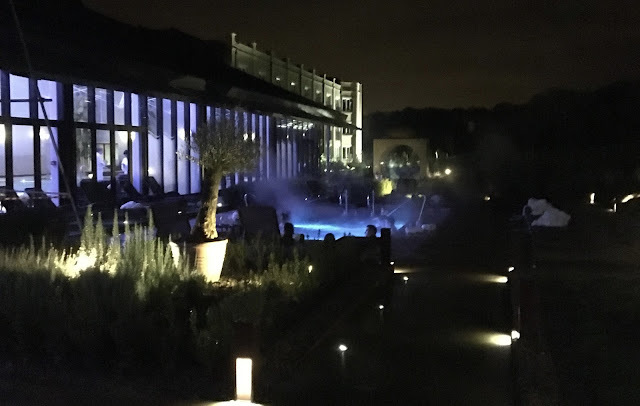 Although I don't have much to compare this against, Ramside Spa was super clean, very modern and offered all you would need for a relaxing time at the spa. Eating out in Teesside has gotten progressively better over the past couple of years. More new eateries have been popping up serving up some delicious grub. Whenever people ask me if I'd like to go out for a meal, my answer is always YES. As I've said before, I do love to cook, but being out and getting your food cooked for you is always a treat. Although I haven't visited all the restaurants I want to in the area yet, I have compiled my list of the my top 5 restaurants to visit for a fancy meal. If you're in need of a place to eat which will provide great food for a special occasion or date night, these are the ones to visit! Cena (I think pronounced Chena) is a serious hit in our household. A modern Italian restaurant situated on Yarm high street with a menu full of delicious carbs. They have an authentic fire pizza oven in which they do some brilliant pizzas with a whole host of toppings. 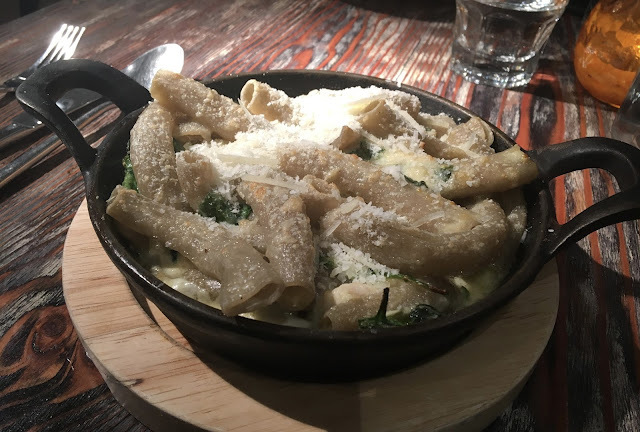 On our most recent visit I had a starter of butternut squash arancini balls, which seriously amazing, then I had mushroom rigatoni bake (below) for mains. It was oh so creamy and delicious. I'm obsessed with mushroom pasta dishes so this ticked all the boxes. This is somewhere I'd visit every week if I could. Crathorne Arms is a country pub hidden away in the little town of Crathorne. Boasting some delicious choices, this place is super cosy and perfect for a romantic meal, or a family outing. Always an option on the menu for all the family, this is quality food in a picturesque setting. Meze Lounge is a Turkish restaurant situated just out of the centre of town on Linthorpe road. It's a small space that serves some amazing authentic food. I always fall a little bit more in love with this place every time I visit. I must admit, I only ever go for chicken or falafels but they do them so well and the extras you get are so good! One of my most recent finds, the Curing House is a charcuterie bar and restaurant serving up some quality cuts of meat and unique cheeses as well as a selection of other fantastic meals. The interior of this restaurant is gorgeous with a stunning retro-feel that is definitely a place to get dressed up for. Don't think that this is only for meat-eaters. I had an amazing butternut squash risotto (see below) with blocks of little blue cheese and breaded tofu. Okay, so this one may be a little bit more low-key, but definitely a good place for a celebratory dinner. Peking Garden is on Stockton high street and boasts all you can eat Chinese food. With a buffet concept, but a menu ordering system, at the Peking Garden you can order as much food as you want and they will bring it all fresh to you table. Be sensible with this, as they may charge you for wastage, but have fun with it. Going in a big group is definitely advised so you can try a bit of everyone's choice! These are my top five but you may have some other favourites. 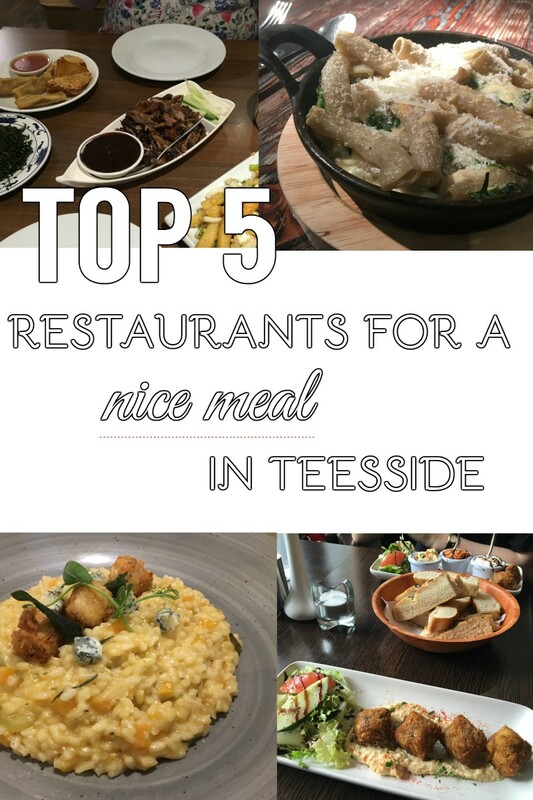 Let me know as I'd love to visit all the best restaurants on Teesside! Have you been to any of these already? 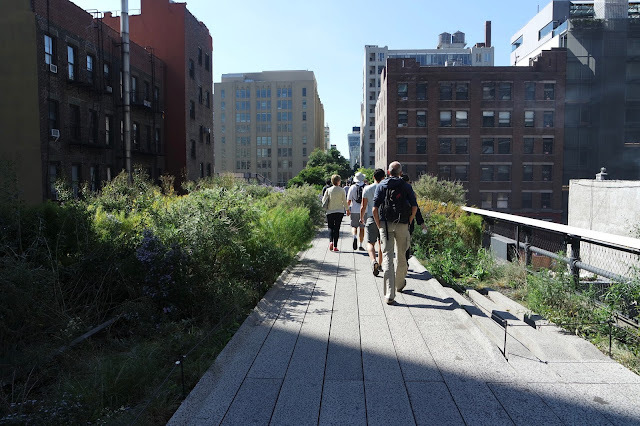 If you haven't already visited, which is first on your list?? 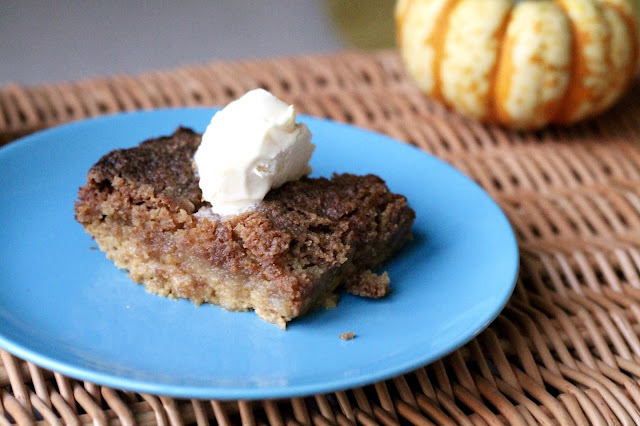 It's been a while since my last Pinterest-inspired post but I had an Autumnal recipe that I was dying to try out before the Christmas season had chance to get underway fully - Pumpkin Dump Cake. I invested in a few tins of pumpkin puree whilst they were in the supermarkets over October so I could easily attempt pumpkin-related recipes. 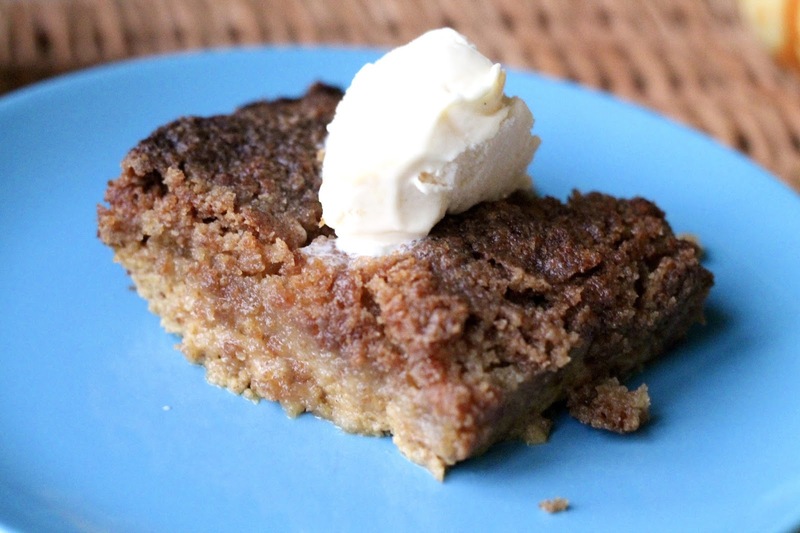 Pumpkin Dump Cake was a recipe that I came across whilst innocently searching pumpkin recipes on Pinterest. It seemed easy and looked delicious. One that I could certainly attempt. I was aiming to take this cake to a bonfire party my friend was hosting but life got in the way and I spent my day at IKEA instead of whipping up this beauty. Rather than not enjoy its deliciousness, I decided to make it the Monday after when I had a cheeky day off. Traced back to The First Year blog, this recipe is really easy to make, you've just got to ensure you've got all the ingredients. Which I guess you need to do for all recipes... Let's just get on with it shall we? Preheat your oven to 180 degrees and grease a large rectangular cake tin (or lasagne dish). Start by mixing the pumpkin, milk, eggs, sugar and spice together in a bowl until combined. Pour this into your dish, then sprinkle the cake mix across the top evenly. Get your melted butter and pour this over the cake mix ensuring that you evenly distribute this. When you've done this, put this in the oven for 45 minutes to an hour checking that the centre has set, the edges are brown and then when you put a knife into the middle it comes out clean. I found that leaving this in for a little longer ensure it wasn't too soggy on the bottom was better, the top of mine didn't burn it just got a little crispier. So, what was it like? It is such a strange recipe for sure, I never thought that adding the cake mix like this would work but it came out beautifully. 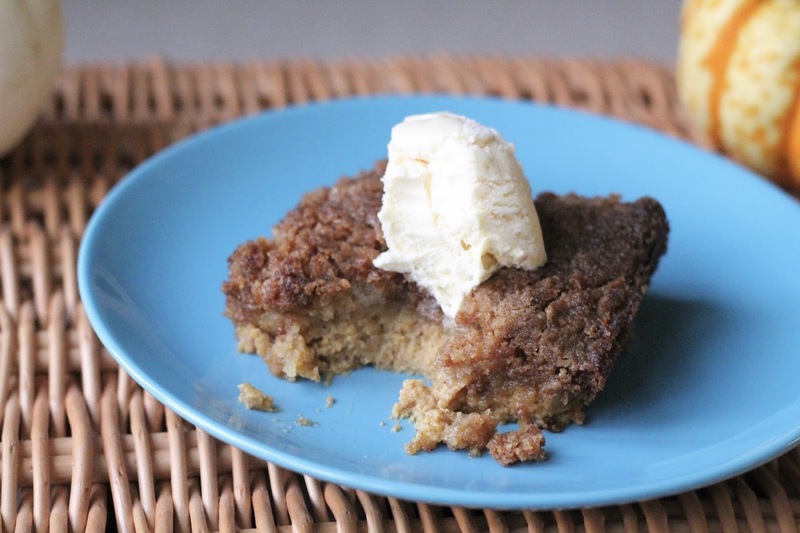 The bottom had set like the filling of a pumpkin pie, gooey and delicious, and the top was crispy and sugary. Warming it up and pairing it with a dollop of ice cream was the perfect idea. Although I'd never heard of 'Dump Cakes' before undertaking this recipe, I'll definitely be searching more out!